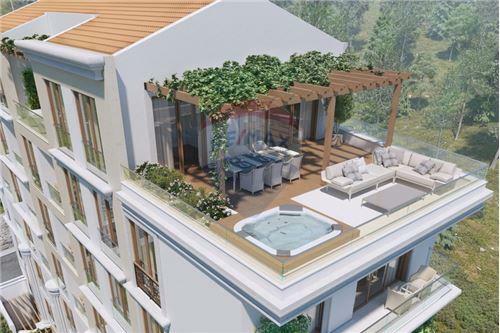 This boutique residency comprises 33 units which are one or two bedroom apartments with built area varying from 39 to 120 m². Prices range from 1500 eur/m2 upwards. The building is designed for seven floors «-1st» up to 5th and a two-level underground parking. Apartments of «1st» floor have their own patios with green plants. Apartments from 0 to 4th floor have spacious terraces with greenery, and the apartments of the upper floor have spectacular terraces and Jacuzzi. The house is equipped with a noiseless speedy lift for passengers and for cars. 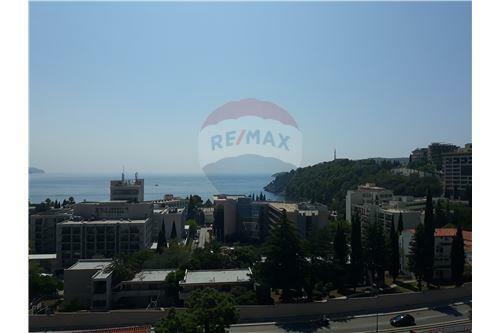 The passenger elevator has a panoramic view of Budva. Lift facilities connect apartments with the underground parking. Residence facade is decorated with columns that are adding elegance to it. On the first floor there is a luxurious lobby zone with marble floors and crystal chandeliers, Management Company office and a concierge/security post. There is also a private gym. 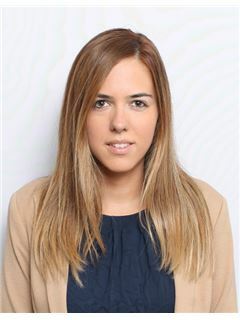 Admission to the upper floor apartments is secured with 24-hour CCTV. Closed private patio with landscape designs is available for the use of the residents. All the apartments are connected to digital TV and high-speed Internet through the system of Wi-Fi routers. The residence is equipped with the latest Canadian Cooper&Hunter air conditioning systems with WiFi blocks which enables you to control the temperature in each of your rooms through the Internet by switching in or switching out air cons, thus, preparing the apartments for your arrival. All residents will receive 5 year warranty on the quality of construction works. The concept of this building allows you to accumulate all features of the active life style combined with modern technologies. In the above pictures, you can see one of apartments. 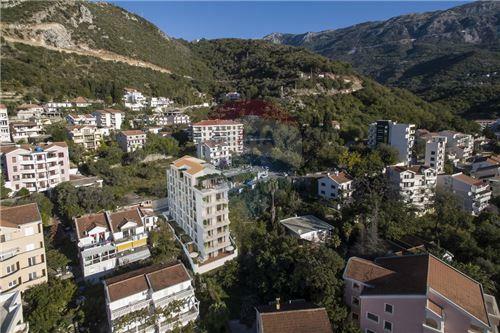 This boutique residency comprises 33 units which are one or two bedroom apartments with built area varying from 39 to 120 m². Prices range from 1500 eur/m2 upwards. The building is designed for seven floors «-1st» up to 5th and a two-level underground parking. Apartments of «1st» floor have their own patios with green plants. Apartments from 0 to 4th floor have spacious terraces with greenery, and the apartments of the upper floor have spectacular terraces and Jacuzzi. The house is equipped with a noiseless speedy lift for passengers and for cars. 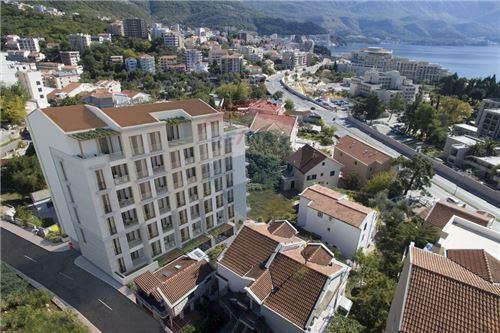 The passenger elevator has a panoramic view of Budva. Lift facilities connect apartments with the underground parking. 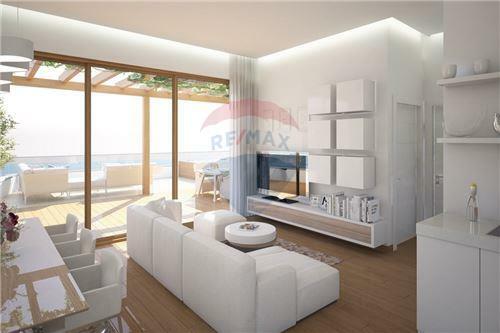 Ground floor 41.80 m2 / € 79,420 Basement 52.12 m2 / € 80,786 1st floor 39.20 m2 / € 82,320 Ground floor 41.75 m2 / € 83,500 Basement 55.02 m2 / € 85,281 Basement 53.87 m2 / € 88,886 Basement 59.16 m2 / € 91,698 1st floor 42.05 m2 / € 92,510 4th floor 39.20 m2 / € 101,920 3rd floor 42.05 m2 / € 105,125 4th floor 42.05 m2 / € 113,535 Residence facade is decorated with columns that are adding elegance to it. On the first floor there is a luxurious lobby zone with marble floors and crystal chandeliers, Management Company office and a concierge/security post. There is also a private gym. Admission to the upper floor apartments is secured with 24-hour CCTV. Closed private patio with landscape designs is available for the use of the residents. All the apartments are connected to digital TV and high-speed Internet through the system of Wi-Fi routers. The residence is equipped with the latest Canadian Cooper&Hunter air conditioning systems with WiFi blocks which enables you to control the temperature in each of your rooms through the Internet by switching in or switching out air cons, thus, preparing the apartments for your arrival. All residents will receive 5 year warranty on the quality of construction works. The concept of this building allows you to accumulate all features of the active life style combined with modern technologies. In the above pictures, you can see one of apartments.